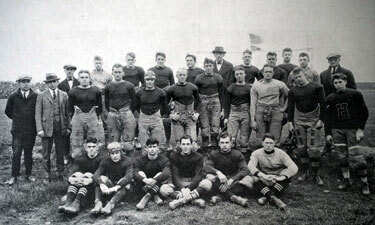 The 1922 Buffalo football team started the season with a new coach. 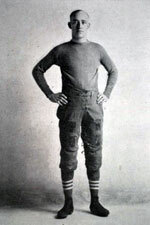 (see “George W. Batterson To Coach 1922 U. of B. Football Team” Buffalo Evening News, 4 August 1922) Gone was Art Powell who was replaced by George W. (Dim) Batterson. ‘Dim’ Batterson was a long time football coach for high school teams in the area and was recruited to the University. Unfortunately, he lasted only one year at U.B. winning just one game. The season review below comes from the 1923 Iris Yearbook. The past year has been one of the most successful in the history of the University, not as regards the number of games won, but in every other way that can be mentioned. For the first time there was an adequate playing field and a properly equipped clubhouse to go with it for the use of the players. At the present time Rotary field is the best football field in the city, properly drained and sodded to give good results in the worst kind of weather. The clubhouse is equipped with showers, lockers and dressing rooms to accommodate a large number of men. There was no early practice and it was mighty hard to get a team in shape for the first game with the time that was at hand from the opening of school. Then too the personal of the squad changed a great deal during the season which made it mighty hard for “Dim” to have a regular team with which to deal with. There were twice as many men out for the squad as any previous year which shows that there is a great deal more interest than in the past. If the same group could have been together all fall the results might have been entirely different. “Dim” certainly deserves a whole lot of credit for the way he worked with the squad and the boys enjoyed every minute of the time while under his supervision. As regards next year we can only see the best of luck for the foundation has been carefully laid and every step prepared so that the results are bound to show. The team showed up very well considering the amount of signal practice that they had before the game. Although a very rainy day the boys handled the ball well and showed a great deal of fight and all were in the best of condition. Thiel brought one of the best teams they have ever had at Buffalo and they certainly were well coached and in splendid condition. The averaged 15 pounds heavier and Buffalo certainly did well to hold the score as low as it resulted. Ailinger made the only score for Buffalo by a nice drop kick from the thirty yard line. Thiel presented as smooth a working team as Buffalo played against. Buffalo’s old rival turned the trick and came out on the long end of the score between these two rivals. It was a mighty interesting game to watch and Buffalo had many chances of scoring, but lacked the necessary punch to carry the ball across. Buffalo out-played the visitors except for a short few minutes and their score resulted during this short letup. Before one of the largest crowds ever seen at a University contest, the varsity held the strong Clarkson team to a score of 18 and 0. They outweighed Buffalo ten pounds to the man, but the local boys fought like trojans and made the visitors work for every point they secured. A fumble and a penalty practically gave the visitors two touchdowns but in spite of this the boys put up a wonderful fight. The playing of “Tommy” Hayes was one of the features of this game, for when he start ed for a man he was sure to come down. One of the best games of the year. The first game between these two teams since 1918 resulted in a victory for Rochester on their own field. Buffalo played Rochester to a standstill for the first three quarters only to weaken and let Rochester make two easy scores. This was rather a thrilling game with many long run prospects of scoring. The punting of Macgavern was a feature, but the boys did well. A large delegation of rooters went down to the flower city for this game and it should be one of the big games in the future. The best game of the year was the last one on the schedule with Hobart, which we lost, but Hobart knew we had a fighting team before the game was over. Buffalo outplayed the visitors for nearly half of the game, but the speed of the lightning like Casper was too much for the local team. Jimmy Ailinger played a wonderful game, his blocking of Krause’s punt paving the way for one of the touchdowns. Jimmy was in every play during this game and showed the stuff which makes the real football player. Hobart won the small college championship and it is to Buffalo’s credit that they held the score as low as it was. After leaving the University of Buffalo, George W. ‘Dim’ Batterson served as an assistant coach in the early National Football League with the Buffalo Bisons in 1925 and the Buffalo Rangers in 1926. He was named the Buffalo Bison’s head coach at the start of the 1927 NFL season. “U. of B. Opens in Victory Over Mech. Inst. 12-0” Buffalo Express, Buffalo, NY, 8 October 1922. “Thiel Rides Roughshod Over U. of B. in Grid Struggle” Buffalo Courier, Buffalo, NY, 15 October 1922. “Alfred Eleven Takes Verdict From U.B., 6-0” Buffalo Courier, Buffalo, NY, 22 October 1922. “Clarkson Is Victorious Over U.B.” Buffalo Courier, Buffalo, NY, 29 October 1922. “Varsity Downs Buffalo, 19 to 0.” Rochester Democrat & Chronicle, Rochester, NY, 5 November 1922. “Fast Hobart Backs Beat U.B.” Buffalo Courier, Buffalo, NY, 12 November 1922. Council on Eve of Gridiron Season. 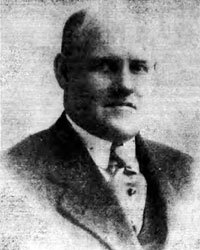 George W. (Dim) Batterson, successful moulder of scholastic football teams, who has been identified with gridiron activities in Greater Buffalo for many years, both as player and mentor, has been appointed coach of the University of Buffalo’s 1922 varsity eleven. Dr. Nelson W. Strohm, president of the university athletic council, made the announcement this morning. Gridiron activities at the university are undergoing a thorough reorganization, which augurs well for the success of teams taking the field for the coming year. While details of a transformation are not contained in Doctor Strohm’s statement, a thorough reorganinzation is being effected. Physically, temperamentally and by experience, Batterson, it is believed, has the ability to cope successfully with the task before him. He is of the aggressive type of leader, and one who can meet reversals , reap some measure of benefit by experiencing them, and pursue his objective. He has been adept at taking green material and developing capable talent. 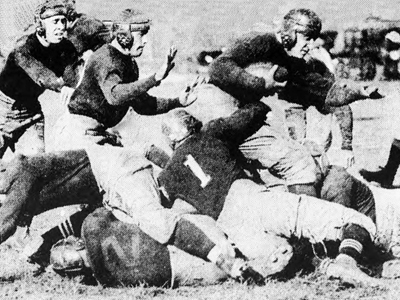 If the squad is as good this season as is has averaged to the past for years, there is reason to expect the U. of B. to make a good showing on the gridiron before its 1922 players stow away their canvas togs. Speaking for himself about the situation, Coach Batterson was not inclined to prophecy. He knows nothing of his prospects other than those which permit him to lend his own best efforts. “I’m going to give the job everything that’s in me and I don’t think I overlook the fact it’s a mighty big proposition,” he said. Considerable benefit should accrue in football at U. of B. this fall, for the College of Arts and Sciences, and the College of Pharmacy and Chemistry will be located in Foster Hall, on the campus at University Heights. Heretofore, pigskin chasers were obliged to travel out to Rotary field from downtown classes. The long jaunt, added to the practice grind disheartened many players and prevented scores of others from reporting at all. Batterson has been connected with several Western New York teams. These prominent athletic clubs claimed his services on the gridiron, namely : Toledo, Erie and Pittsburgh Athletic clubs. He has earned success as a coach of local high school elevens bringing the Harvard cup to Mas ten Park for three successive years in 1918. 1919 and 1920. Last year Batterson coached the Hutchinson-Central team.